The Greyhound is gentle, intelligent and affectionate. Greyhounds are very good-natured and gentle with people of all ages. They are an intelligent breed and use their own initiative, especially if they believe they are given pointless instructions. Greyhounds need gentle and persuasive handling. They tend to quite cautious with strangers but get on well with children. Greyhounds need occasional grooming with a soft brush. The ears should be checked often and the claws kept trimmed. 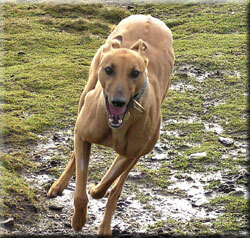 Greyhounds need regular exercise such as daily walks and opportunities to run freely in an open well-fenced area. Because they are bred for racing they like to have a good sprint or burst of energy and then they tend to relax and lay back for the rest of the day. It is important to remember that Greyhounds are bred for sprinting and not as long distance runners. Greyhounds can be traced back to 4000 BC where they are depicted in Egyptian carvings. It is believed that the Greyhound arrived in Britain in pre-Christian times when the seafaring Phoenicians used the dogs as goods for bartering. Despite the Greyhounds long history their breed type has hardly changed. It is believed that the name Greyhound originated from the words 'great hound', 'Greek hound' or 'gazehound'. But one thing for sure is that the name has nothing to do with the color. General Appearance: Sleek, muscular and active. Color: Blue, white, red, black, brindle and fawn with or without white patches. Tail: Set low, long, tapering, curved slightly upwards and carried low. Ears: Rose shaped, small and set high. Body: The body is tall and elegant and the chest is deep and wide. The ribs are well sprung, deep and well back. The back is broad, muscular and well-arched and the shoulders are well laid back, muscular with good angulation. Greyhounds will instinctively chase anything that moves quickly and will need to be trained and well socialized with other household pets such as cats. Greyhounds are sensitive to the cold as they have very low body fat and should not be left to sleep outside in cold conditions.